the first Professional Baseball Player in History who also has Autism. Baseball is a worldwide language, it speaks to all of us in different ways. It can be a sometimes bumpy yet awesome never ending marathon full of growth and magical moments. It takes an unwavering belief in one’s self from the inside out and in their ability to create their own path, in baseball and life. For one great man, Tarik El-Abour who also has Autism, what seemed to be impossible, an insurmountable goal, became possible for him. He made it his reality and it's still growing. The lesson here, never ever under-estimate the power of passion and persistence, the love for the game and surrounding yourself with those who believe in you as much as you do if not more and will always look out for your best interests. It all started when Tarik El-Abour was 10 years old. A big Nascar Fan, a love for the wheels, the motors, the laps, the stats, the names, the colors and the cars, occupied this little boys mind and life all week long for three years, one car race after another, not missing a race, on Sundays, not missing a Lap, and knowing enough information to speak about each driver, each announcer, each team and their origins and of course the stats and history of each driver as though it were information we would all know naturally if we truly loved our sport. He loved cars so much we had every replica of the cars and he would line them up, all equal distance apart on our living room rug and duplicate the races, even on the turns and it would take him hours and he would not get up until the cars where perfect and he would just walk away from these masterpieces each day and start all over the next day and this kept him occupied in between races. I would be so amazed at these masterpieces that I would take pictures of them over and over again because I simply wanted to remember how beautiful it looked to walk into the living room and this race track in still motion still there waiting to be changed up for the current day. What a peek into how precise his mind worked and looked as he would do this so effortlessly and it would be something that would take me hours to do. When he was 8, 9, 10 Years Old, Tarik also would go outside, put an X on the garage door and threw the ball at the X for hours. At school, he would throw a ball at the handball wall at recess and continuously hit his mark over and over again. I thought to myself, He could truly be a pitcher one day, however he loved car racing so much, I thought his throwing the ball endlessly was just a pastime for him and it gave him something to do when he went out to play. I never bought him video games and at that time they were really big and everyone was involved in the early video games in the late 90's. I realized with Autism, he would get engrossed in anything that he loved and I wanted him to go out and play rather than to sit in front of the TV all day, since he gave racing so much of his time already. 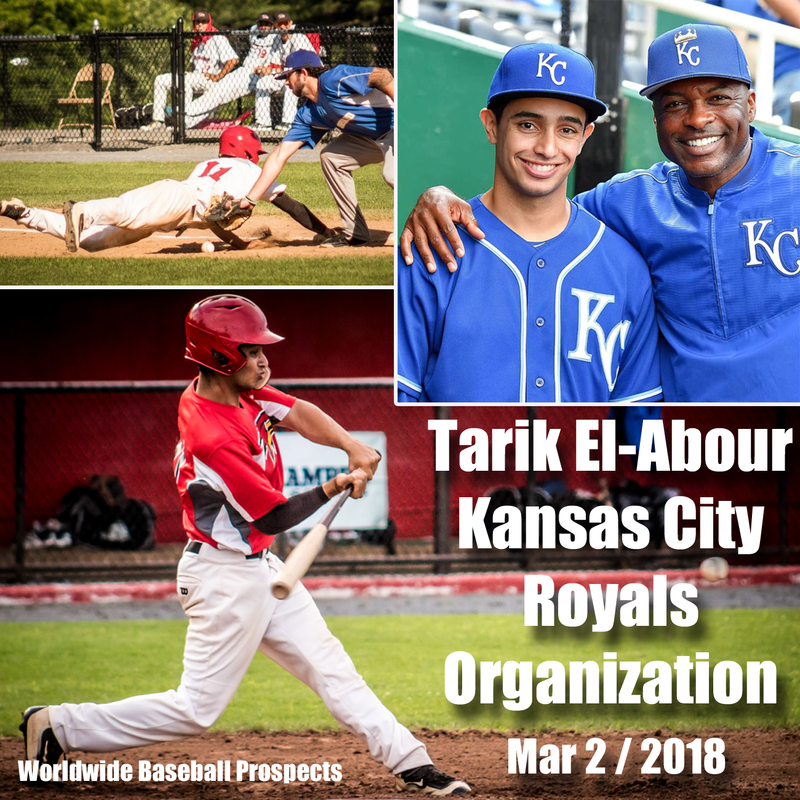 When Tarik was 10 years old, His Father, Abed El-Abour signed him up for little league and he played baseball for the first time in his life. He was amazed. That first time he played baseball, he went to his Coach and said, I want to hit the ball. His first coach, Mr. John Mayberry, said to him, "Well, if you want to hit the ball, you have to learn to go out in the field and catch the ball too." It was on. He wanted to learn every aspect of the game. That is when I started to see the workings of the Autistic mind. I started to see how numbers had a lot to do with how he thinks. We think in concepts, he thinks in numbers. The greater the number of times he did anything the better he was at it. Just like us, however the way the numbers worked in his mind went way further than anything I could have yet imagined. He knew he had to practice. He knew he loved it. And he came to me to tell me that when we grows up and plays baseball, he will buy me a house where ever he plays, so that I could watch his games live. He did not know yet how different he was. He did not know yet how Autism was going to speak for him before he could speak for himself. One day I walked in his room and he asked if he could ask me a question. I said sure, go ahead. Tarik then proceeded to ask me questions about not needing information he had acquired so far anymore and how to take that information out of his head to make room for the new information he was getting from baseball. I asked him, what information do you want to get rid of? He said, that he now loves baseball like he loved NASCAR and that he no longer needed the NASCAR information, so he in essence wanted to delete that information. I said to him "if you ever figure out how to delete information from our heads that we learn and do not need anymore, let me know." It became a joke, however his transition from watching sports to playing sports took on a work ethic in him that I could only learn from along the way. The word "No" means nothing to the Autistic mind. The word "How" replaces the word No. He would practice with his team, he would practice at home, I couldn't buy enough books, for him to read, so he would watch the Dodgers every game, and memorize the stats and history of each and every player in the league on every team, knew the history of every team, the managers, the players, the origins, every at bat, every comment and when the Dodgers were not on, he would go to the book stores, lay on his stomach in the isles and read the stat books on the players and get hungrier and hungrier for any morsel of information he could learn about the baseball teams, players and history. He drove his coaches nuts talking about stats, and they would tell him Baseball is so much more than stats, yet to say that to a mind that thinks in numbers this was illogical. They were telling him how important it was to be a team player, yet that only confused him further, because he never thought of not being a team player. He only knew that from all the stats that he has learned, that those stats painted a picture of the work of each player so he saw the stats as a language that speaks for itself. He did not understand the disconnect from not being a team player by being interested in stats, he saw them as going hand in hand, that they were two different parts of a whole picture. He would tell me, if you do not have good stats why would a team consider you? When we was twelve years old, I went to pick him up from practice and he gets in the car and I ask him how practice went and he says to me, I wanted to hit a home run tonight and I didn't. I said, that's Ok, you have a really good chance of hitting and ground ball, since you guys are so young, fielders give you a great chance of getting on base. He looked at me confused again and said to me, "Mom, I do not want to be successful based on someone’s error or fielding, I want to be successful because I am successful." I was stunned and I realized in that moment, the drive he has, I have not yet seen in anyone I had ever known. From then on, he never missed a game, played traveling team baseball and was the one of the first players to play with a traveling team in our area call Playhard BASEBALL started by Danny Ricabal, and I called Danny, they wanted a monthly fee and I could not pay it, and he allowed Tarik to play anyway. Every month I would make the coaches sandwiches and cookies and do what I could at the time to repay them for the opportunities he gave my son. One night Danny, stayed after practice in the park and continuously hit fly balls to Tarik, realizing Tarik needed a lot of repetition to catch fly balls and fielding and I sat and watched them for hours, neither one of them tiring and that included me. I always loved baseball, I understood the game so well, because my Father, who came to this country in the early Fifties, discovered baseball, in Chicago and was a diehard Cubs Fan. My Father watched and never missed a baseball game. He worked in a grocery store that he owned seven days a week. He had a TV in front in the store and in Back by the meat counter. He talked about baseball to anyone who was interested in Baseball and he had a Customer by the name of Bill Gleason who was a sports columnist for the Chicago Sun Times and one day was asking my Dad, Charlie Bedwan, what he thought the Cubs should do to set up their next season. Of course my Dad had enough opinions, and he gave Bill every one of them. The next days, Bill stops by my Dad's store on his way to the train station, and says to my Dad, "Charlie pick up the paper and look at the back page." And my Dad did and Bill had written the article about him and his love for baseball and what he thought the Cubs should do to build a winning team the next year. My Dad watched every game and yet he never had the opportunity to go and see the Cubs play live. He never went to the stands, never felt how it feels to sit in those stands and cheer for your team, he did it all to the TV! Little did he know that one day He would have a grandson that would love baseball as much as he did, and also a grandson who would have an opportunity to play the game, as a child, learn the game, love the game and stand by the game with a loyalty as fierce as anything he had ever known, and now wants to play for the Cubs simply because his Grandfather loved the Cubs so much. Tarik's Grandfather passed away in on July 7, 2005. Tarik at the time his Grandfather Charlie passed away was 12 years old. Tarik is now 22 and he wants to play for the Cubs. He wants also to be the first Autistic Major league Baseball Player and of course no mistakes, sees that the Cubs are involved with Autism. What a testament to Autism to find a player that loves and plays the game. He knew his grandfather worked everyday and that is what made him a successful store owner, so he worked everyday to be a successful baseball player. Everyday meant everyday to him. He would practice with his team, and then come home and practice some more. Now at 22, he gets up at 4:30 am to get to weights by 6am, then to practice, then he comes home, eats lunch, does homework, goes hitting at Full Count in Pasadena, goes to the gym to do resistance training and cardio and then comes home to watch Laker games, catch up with Baseball stats and games in season, and then goes to sleep to wake up and do it all over again. Tarik is graduating from college this year with a degree in communications, so that when he retires from baseball, he can be part of broadcasting the games. Tarik went to College to play baseball. He got a degree in college against all odds with no special needs and studied on his own to get the grades that keep him playing baseball. He one day looked at his sister, (picture bottom left) Sarene El-Abour, asked him why he works so hard, and he said about school, "I am just doing what it takes." There are so many stories abou t coaches, coaching, playing, not playing, stats and great moments and many hard parts that tested, chiseled and formed the baseball player Tarik is today. Tarik always started baseball games and never knew any different until he hit Varsity Baseball at San Marino HS, in San Marino California. Head Coach Mack Paciorek, was young and really believed in Tarik. There were three other coaches, Joey Molina, Jeremy Cardenes and Marcos Bugarin that had a great influence on Tarik's love for baseball. Marco, at the awards dinner, said in the introduction to Tarik, that Tarik made him excited about Baseball all over again. Tarik was not slated to start and he did not know why. His stats where always good. He was always in the top three. Yet as he got older his Autism spoke before he could speak for himself. Decisions were made because of it. He was not slated to start in his senior year, yet the player that was going to start got injured and the injured player played left field and now Tarik was the starting left fielder. He batted .393 that year and he received Team Offensive Player of the Year both his Sophomore Year on JV and Senior Year on Varsity and he received, Second Team All Rio Hondo League in HS Senior Year on Varsity. He loves stealing bases and as a Mom, would turn me into a nervous wreck watching him inch over and then find his moment and take off. I could only scream from the stands, being a Mom and wanted to protect him, when all he could see was an opportunity. As Tarik got older his challenges got bigger. He was taken aback by his challenges simply because he worked so hard for his numbers thinking that was all he had to do. Autism thinks in numbers so it was logical to him that if numbers are good, you play, if they are not you do not play. His best position is center field simply because he was first trained in center and he can run. There is enough action in center field as well, to where you are totally alert and he can see to home plate from there and anticipate every move. He can see more than we can see and he can hear more than we can hear. Autism is ultra alert. Offensive player of the year was an award he easily received. When he stands at home plate that is when he is not nervous, it is when he is concerned about playing or not, that is hardest for him to deal with. Because they deal with numbers, the number of times he bats the better he gets. Like anyone, yet this fact is especially true for Autistic's. He would come home and say, they called a ball on me and it was a strike! Imagine the precision of the ball and his awareness of the ball. We see about 100 frames per minute. He sees a thousand. The only time he is not great at the plate is when he is not played all the time and they give him a chance, because he thinks in numbers that is when he takes pressure to the plate with him. In his second year of college, he was on a team for Pasadena City College. Coach Evan O'Mara red shirted him his second year, and you would have thought Tarik Died. I think he did however his body was still here. Until now, it was the hardest year of my life with him. He felt like he did not have a team, that he was not good enough to play, that how could he love something so much? Work so hard at it, Put up pretty good numbers? I had to go and see his Coach and I rarely make an appearance like that, however until now, it is the only Coach I had to go and speak to one on one. I had to ask him how Tarik was at school because at home, he could only talk about how bad he felt and nothing else. I did not know or have a way of making him feel better. He started researching players who were red shirted and still became pro. He would tell me the stories...and it hit me. Every time something happened to him, I would just tell him, "let whatever needs to happen, happen. Your job is to do your best, the rest of what happens to you just makes your story better." Tarik was then pursued by Concordia University in Irvine CA. He was so excited! He would be living on his own, it was small school, he gets there and the first day of school he gets a text from his coach and he is asked to go to the coach’s office. His Coach was Mike Grahovic, and so Tarik who was filled with feelings that he could not believe he was there and thought he had a good chance of making the team, and he was so proud and got such a warm reception from others and teammates and would go and run in the mornings on the track and at night, and he was feeling like he had just arrived at the happiest place on Earth! So he gets this text from his coach and he goes to his coach’s office and he asks Tarik that in classes that he is taking, if during the introductions he was telling people that he came to Concordia to play baseball. Without Tarik replying, He said to Tarik, "Did you make the Baseball team?" And Tarik again did not reply, coach went on to say, we do not talk about what we do here, we do it. Two weeks later, Tarik got cut from the team before he even played or practiced any baseball. He immediately thanked the coach for cutting him loose that early on and called me to tell me what happened, and immediately called one of his old Coaches, Marcos who was a college coach at another school, dis-enrolled from Concordia University and within a week, he was at a different school and started that year, at Pacifica College in Anaheim and his stats were .378. His determination does not understand the language that said NO to playing baseball. Tarik has always had a team of Supporters and one of his biggest supporters since his early High School days has been J.D. Nicholls with Worldwide Baseball Prospects. He has kept up with Tarik over the years and connected Tarik to a network of ball players and events. He was like a Super Coach and guided Tarik's baseball life with great understanding and care to his situations and gave him his time and his love and his advice throughout this time, even till today! He met Coach Story-Harden through JD, and he was invited to play in Nebraska to participate in a summer league tournament! And then there is Coach Larry Rush who was an empire at Urban Youth Academy in Compton, CA. Tarik wanted to play in the summer and he went to the Urban Youth Academy. Coach Rush came to me one day and asked if I was Tarik's Mother. I was thinking to myself that he was going to make a remark about Tarik's Autism, however he asked me where he learned to swing like he did. He said he tries to teach people to swing like that and that he is so calm at the plate and he has only seen that in the pros, yet not in anyone that young. I told him, Tarik just finished playing at Pasadena City College, and he wanted to go back to his old swing and he did. He got to know Tarik and worked with Tarik as well and built in more power into his bat. His current Coach, Tom Zieglowsky (pictured right) also known as Coach Ziggy, shares Tarik's pure enthusiasm for Baseball and that is the bond that binds them. A trainer at Gold's Gym in Pasadena, David Bernstein, would take Tarik to Cal Tech in Pasadena, CA and time his runs and would send me pictures of the times that he ran 60 yards. All the love, the patience, the support without all of these great people who not only loves sports, but love the blood, sweat and tears it takes to play to build a player, one hit at a time, one bat at a time, one run, walk, stolen base, one encouraging talk when it was needed and a very hard push when needed, turn love in action and then into love again. Tarik is an example of if there is a will, there is a way. He is an example of nothing thinking of hard work, but doing what it takes. He broke every excuse in half and just kept going. In high school, in little league there may have been many people that he played with that are no longer playing, for many different reasons, and he has learned that if you love baseball there is messing with the heart of a baseball player. All of this work truly took a village. Villages of many souls who love baseball so much that their lives are devoted to the sport that’s moments of glory and a single at bat make everything that we all have to do, worth it. 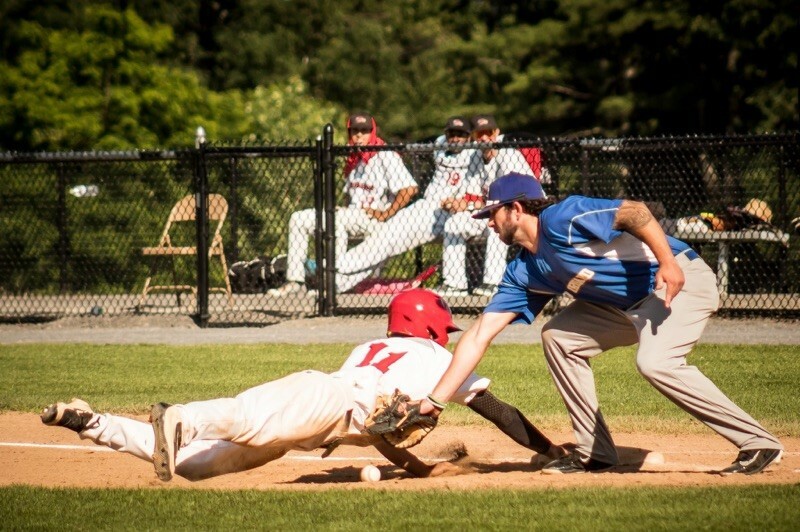 Baseball is a game of many mental plays, and physical training combined to create strategies that are unpredictable and unique to every game. Tarik taught me too that every unique player gives the game life and takes the sport to a whole new level when those who play it love playing it more than anything else they could choose to do in life. America is the baseball field of dreams. Baseball is made up of the dreams of the players who play it. When people ask Tarik if he thinks he would make it to the Pro's, he would say, "If everyone thought they wouldn't make it, then there would be no baseball players." It is a game of will and perseverance and that is what lives in Tarik's actions each and every day he says to me, "I got to play baseball another day." Tarik is graduating May 2015 from college without any help from services for Autism, just to keep grades to play ball. He does not want any special services he simply wants to be like everyone else. He wants to play for the Cubs. He wants to be valuable to his team. He wants to take all the advice he got, the support of all the people who grew him and supported him along the way, to remind himself and all of us that no matter who we are, we have something great to offer when we do not give up on ourselves. "There is no such thing as giving up" he said, "someone just made that up as a way out" "I do not want a way out, I want a way in". It takes a village. A village of people who love baseball. A village of people who love dreams. A village of people who believe in the capabilities of each and every person who has the drive to forget the “NO” and are re-inspired by the word “YES”. When the word “NO” does not exist neither do excuses, fear, doubt nor worry. What replaces excuses, fear, doubt and worry is drive, dreams and determination. His outlook taught me to never think for a minute that I should not try. Adding action to my desires. Like him. He brings out in me, in us, a new way to think of something that we get caught up in when it comes to numbers and when it comes to how someone looks or who someone knows. None of that exists for the Autistic mind. What does exist is work ethic and passion. Thoughts that keep improving his game, learning about anyone who has ever played, where they came from, their stories, their drive. He yearns to know their road to continuing to play baseball just one more day in the life that is he planning around a bat and a ball. At first he does not look like much. No big hits out of the park, no standing out because of height and weight. He blends in pretty quietly until he starts to nickname all the other players and he speaks the truth that at first feels interesting to hear and then you start to realize he speaks on the unspoken and everything around him settles because of that truth, that he cannot help to speak on whether it is about him or what he observes. He has a very childlike way, yet when he is serious, that is when you can’t hear a thing. When Tarik is quiet, I know he is asleep, it is the only time he is not discussing sports, coaches, movements, fundamentals, managers decisions, his solutions and positioning players on teams so that they teams are balanced and can prosper. I realize he is a sportsman if there is such a thing. He trains, he plays, he understands strategies and he looks at every nuance that exists on and off the field, in every conversation about baseball that you end up talking to him about. Last year Tarik graduated from college and for the first time, after graduation found himself without a team. He played on an old Sunday League he played on in the past, yet he wanted more. His drive trains him. It took me his whole life to realize that it is his drive training him. He would call people, can you throw with me, can you hit balls for me, can you time me, can you pitch to me. With all that, he would wake up at 5:30 AM and go to the park and do plyometrics, come home for a shake, go to the gym and do resistance training, then come home again and walk the long sides of the block and sprint on the shorter sides. Once all that was done, he would come to ask, “What else do you think I should do?” He would go to the trainers in the gym to ask them to look at him for a minute and tell him if he is doing things right. I watched this for now, thirteen years, from the first day he discovered the diamond on the field. When he was thirteen I got on the internet to find an organization whose sole purpose was baseball. I did not even know what I was looking for, I just needed an outlet for the passion that was dominating our household and looking for places to play yet more baseball. I found Worldwide Baseball Prospects and a live person answered me back and followed up with a phone call. That phone call still rings in my home today, to the tune of everyday asking me about Tarik and his progress. This man, JD Nicholls, we call ‘The Baseball Angel’. He has guided, educated, listened and mentored Tarik. He is a voice, a mentor, a friend and a lover of baseball that carried both of their souls to the building of a path, a road, a street, a destination and a future of being able to continue to play baseball. Tarik had a trainer at the gym, David Bernstein (pictured right), who was previously a track athlete and ran in his college days on the track team at Cal Berkeley who volunteers his time to go to the park with Tarik to time his 60 yard runs so that he can track his progress. And the Village at Golds Gym in Pasadena, Ca of people who caught onto his passion and give him love and their priceless advice and guidance. There is one thing I have learned about the Autistic Mind and that is that the Autistic Mind does not respond to negativity. AT ALL. They do not accept it and they do not entertain it, they reject it. When someone is negative, they walk away because they believe that person has their own issues to work out so that they cannot come to them whole. They seek out positive people, positive environments, and positive role models, because they see value in every soul and know that their true resources are through the sharing of each other, of the knowledge's we possess and using that knowledge, to them, is their door to learning and growing. Baseball is baseball. Baseball is the breath that Tarik breaths and it exists in his every thought. He had to bring his body up to the task and in this day, I write you with an opportunity that comes to his soul in this coming week. By the time this article is published we will know the outcome. He is going to a Professional Baseball Camp in the Empire Pro League in Georgetown Delaware, with the Director of Operations Eddie Gonzales, for a possible acceptance to be able to play Baseball just one more day. Tarik sees everyone’s dreams as dreams to conquer. He knows that our dreams need our dedication and our dedication needs us to push, pull, challenge and push ourselves again. Thank God for the diamond, the bat, the ball, the smell of the grass and those who want to play. Then we all get to watch baseball, just one for day. What happens when you take passion, add to it desire, add to that perspective and knowledge and then just do what you love each and every day? Well, if it is applied to playing baseball, you get a baseball player. Playing baseball does not come easy. It is a game where hitting three out of ten balls is great. That means you have to know how to deal with the seven balls you did not hit. As a young player in little league there are a bunch of children learning the game. Your first exposure to coaches and coaching is beginning to take form. You cannot yet imagine what is to come, however you do know you love the game, you love having a team to belong to so you can play the game, you love getting out there every day in the sun or even light rain to practice as you get accustomed to the smell of the grass, the feeling of the field, the different times of day that you play and the feelings that come with fielding, being behind the plate, pressure in game deciding at bats and the crowd that loves you and is silent when something no one wanted to happen happens. Baseball is a game of chance. Chance is something Autistics do not understand. They understand working for an answer. Their work results in a finite answer. 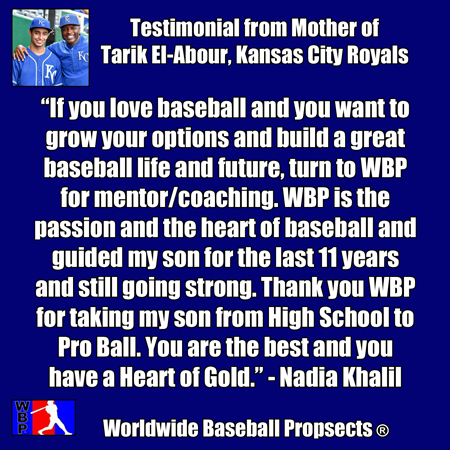 Tarik has had a baseball mentor since his was 14 years old on his first team in High School from Worldwide Baseball Prospects (WBP) and WBP kept Tarik in balance all of the baseball hardships he faces along the way. WBP also worked diligently to look for opportunities for Tarik to advance to the next level of baseball. Without WBP, Tarik would not have been able to understand the process and WBP gave him the support he so badly needed. With the guidance and mentorship of Worldwide Baseball Prospects® for 11 years, Tarik El-Abour, 24, is a Professional Baseball Player. Tarik, signed his first official pro contract on June 21, 2016, with the Empire Professional Baseball League. Signing that contract did not come easy. Any player who takes on the challenge of the dream of playing Pro Ball understands the challenges that come with making it on one team, let alone the many teams, coaches, fields, cities, countries they play in along the way. Tarik is Autistic. His thinking is the opposite of chance, yet his love for baseball forced him to learn to understand chance and to be able to handle the rejections that were coming his way. When he was in middle school his speech pathologist told him he should have a plan B because wanting to be a professional baseball player is only a dream. Once Tarik left that school, I noticed he never would pass that school or never want to be in that area. I asked him one day why he was avoiding the school and the entire area the school was located at and he simply said, my speech pathologist does not believe in dreams and that is where she told me that. He associated that entire area with no dreams and he did not want to be reminded of that so he avoided the entire location all together. In Junior College, mind you, he went to college to play baseball. In his mind that was his major. His minor was the business degree he received to play baseball. At first he thought he was receiving a degree in communications, because the last school he played at was a communications school. He was doing all the school work, studying all night to play and practice baseball each and every day he could in his life. For him it was all about having a team. And it still is. In Junior College upon his exit interview, he coach stated to him, Tarik you did a great job. I am sorry this is the last team you will play on, no other coach will take you on like I did because you are autistic. He never told me that happened. He simply threw it out with all the others who did not believe in dreams. I have to tell you about his first spring training in Georgetown Delaware. Spring training was for a week and then cuts would be made on Saturday morning. He gave it his all, Channel 7 news came and did an interview on him the day before the cuts were made. He was upset that they wanted to interview him before the cuts were made because he never assumes his position until all is said and done. Right before the interview one of the business people in the program says to him while he is eating lunch, what will you do it you do not make it? That completely threw him off and he did not want to come out to do the interview. I told him it is part of the process of being a player and he’d better come out right now and do this interview, the entire crew and cameras were waiting on him. He finally came out, and he held his head up and did the interview and I was humbled by the depth of the love this human being has for the game of baseball. Again, the man who said to him, what if you do not make it, what will you do, he could not get himself to talk to again. He feels that those that speak in doubt do not believe in dreams and he can’t handle hearing the language of not making it so much he avoids it all together. The week went by and Saturday morning came. He asked me not to go the event of cutting players and putting others on teams. I did not go as he wished, and about two hours into it, he calls me and tells me he was cut. He said, Mom, I was cut. Come and pick me up and when you come, please do not talk to me, just pick me and up and we will leave. So I went and as I was driving, I see him standing there with his baseball bag and his suitcase, not talking to anyone. He gets in the car and there is total silence. He wanted to cry and couldn’t cry. I wanted to cry and couldn’t cry. It was just this shock and silence combination we have never experienced yet. We get to the hotel and we carry everything into the room and I immediately start booking a flight for him to return home with me. I for some reason must have been so sure he was going to stay that I bought him a one way ticket. Once I purchased the ticket, I look at him and told him to come and stand by me. We were both facing the mirror and I said to him, look at the boy you see in the mirror. He is the strongest person I ever met and that the way he dealt with his disappointment today tells him how much strength he has and how well he handles himself. So I said to him, look, we are in Georgetown for another day and I do not want to spend it in a hotel room sulking. Let’s go to Maryland and have lunch and spend the day and then we can come back and get ready to go home. Still in shock, we get ourselves together and we go. We are driving and I had my sunglasses on and I started to cry and figure it is ok, he can’t see my eyes. I put my hand on his shoulder while I am driving and he still has no words yet to say. Then about 20 miles into our ride, he says to me, I am going to go back, make adjustments, work harder and try out again. I said ok. Silent again, I get a phone call. It is Eddie Gonzales calling to ask me where Tarik is. I tell him Tarik was cut and he is with me. He asks me, ‘where are you?’ I tell him we are driving to Maryland to have lunch. He said, ‘I was looking for Tarik, and I couldn’t find him. There are two teams fighting for him now, why did he leave?’ I said he told me he was cut and to come and pick him up so I did. I was told he was cut from one team, yet there were still three teams available. Tarik did not understand the how it all works, and thought it was over. In the meantime Tarik is listening the call, and he immediately starts crying like a person holding in the titanic and then letting it all go loose. He was sobbing not believing what he was hearing. Eddie said to us go and have your lunch and come back after. We hung up the phone and Tarik looks at me as says, we are turning around now. I said yes we are. Then he asked me to pull over for a minute and he went into the fields and screamed his head off, a scream I never heard till this day, so deep and so releasing of everything he was holding in. He almost couldn’t cope with how low he felt and then to adjust to such news. He gets back in the car and we are both silent only now for different reasons and I think it was all just too much to take in. We head back, no lunch, to meet with Eddie and see what is going on. By the time we arrived, Eddie was standing with the two coaches and one of them came up to Tarik, shook his hand and welcomed him to the team. We were in such shock, our voices were low and we had to apologize for our condition. We were happy and understood what was going on and we were in shock at the same time. We went from taking Tarik home to Tarik staying. We realized we had a lot to do. We repacked his suitcase, got his hair cut, bought him a new phone, once he confessed he threw his phone when we heard he was cut and we did everything to get him ready for his call time of 6 AM, to start his journey to New York. I left him there and would find out through the internet the highlights of his games. This was his rookie year. He went pro. And still he looks at it as a step in the right direction. Every time he got called up he put it out there that he wants to play. He had a .323 batting average and went on to be Rookie of the Year for the Empire League 2016. When we found out, he said Mom, I do not feel like that was my best yet. The best is yet to come out of me. And he left to go and do his daily workouts. He works out every day, does plyo in the park, hits at the facility and throws with his old high school coach, Joey Molina's college team before games. All this around his job in construction between baseball seasons. His love for baseball is a life lesson for the rest of us watching nothing stop this soul from living what he loves. It is not a matter of yes or no, it is a matter of how. Now it is simply his life. His next step is get to have the honor of playing in the MLB. The stories continues and the love grows with every step. Baseball is a world of people who cannot help playing the game. As much as we cannot help watching and cheering the player on. 2016 - After college Tarik was assessed by WBP Mentor, Cubs Tom Myers. Coach Myers gave direction and a starting point with the tools Tarik must improve on. 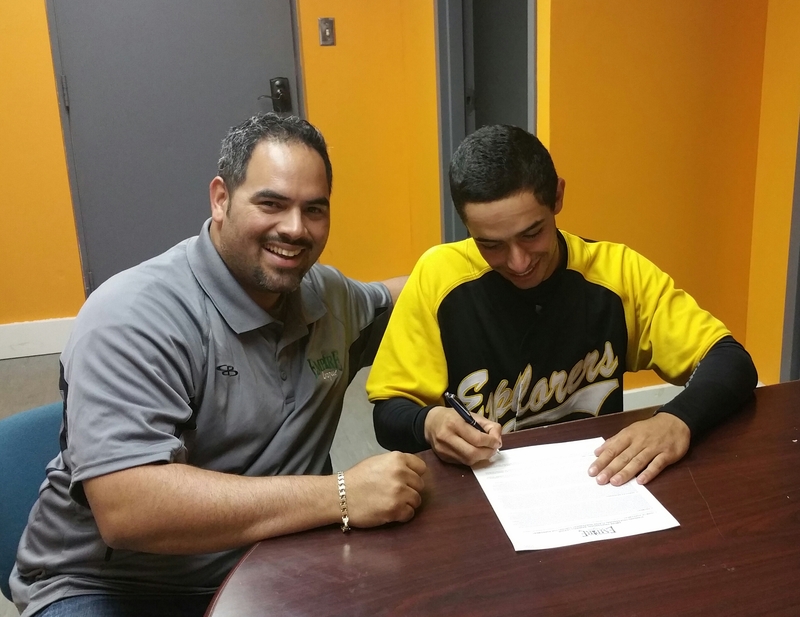 2016 Signed with the Empire Pro Baseball League, under Eddie Gonzalez. Summer 2016 - A successful 2016 year, Tarik, won Rookie of the Year honors in the Empire Pro League. Fall 2016 - Tarik headed to see WBP Mentor Brian Niswender, MA, CSCS owner of 5 Tool Baseball Consulting. Brian Trained Tarik for a month and assisted in developing his off season strength training program. Jan - Tarik headed to Puerto Rico's, PRIBL, where he stayed for 5 weeks and trained and competed with A,AA and rookie level players. Tarik was invited by Reggie Sanders to throw out the opening pitch for the KC Royals Autism Awareness Night among other things by the Royals. - In 2017, Tarik was the the 5 pick overall in the Empire Pro League, 2nd pick on his roster for the Plattsburgh RedBirds Professional Baseball Club. - Tarik has run a verified 6.1 and 6.4 60 Yard Dash. Trained locally by Trainer David Bernstein. - Tarik had a great year, Only struck out 6.7% of the time out of 110+ at bats in 2017. - Tarik made the 2017 All-Star Game. Players who chosen for the EPBL All Star Game were chosen by computer program. No politics or League Personnel influenced any portion of the picks. Tarik earned his spot based on his ability/stats. 2017 - Tarik has now concluded his second year of Indy Pro Ball in the Empire Pro Baseball League. - During the fall of 2017 headed to Pirate City, in Bradenton Florida to train with WBP Mentor and Hitting/Outfield Coach Kory DeHaan of the Pittsburgh Pirates. - March 2/2018 now member of the Kansas City Royals Organization. - April 25,2018, Tarik earned his first affiliated professional hit with the Kansas City Royals. A single up the middle on is 3rd AB of the day. He would later score to tie and end the game 4 - 4. His first two at bats he was hit by a pitch and flied out. - 2006 to present Tarik continues to be guided and mentored by Worldwide Baseball Prospects. *Special thank you and eternal gratitude to everyone who believed, believes and still supports Tarik with his journey. If you are interested in this story, please email us through our email page thank you. All three articles are printed in Baseball the Magazine.